Memorial Day unofficially kicks-off the summer and I’m sure there’ll be plenty of cook-outs and parties going on during the long weekend!! Memorial Day is a national holiday in which we pause and remember all of those who gave their lives while serving in the armed forces. Many visit cemeteries to pay honor to those who died in military service and many others attend parades honoring those who gave their lives. 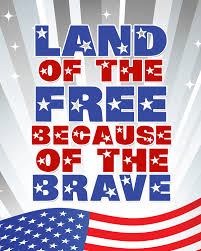 So as we enjoy the long holiday weekend, let’s remember to pray for our nation’s heroes and the high price they paid. School is out!!!!! Our last day of school was Friday and it’s a good thing because the kids were bursting with energy and enthusiasm this last week – they can’t wait for summer!!! Things have been really busy since Easter as we’ve celebrated Confirmation, 1st Communion, May Crowning, the Middle School play, and 8th grade graduation. Please keep our little ones in prayer as they enjoy the summer!! With school out for the summer our daily Mass schedule will also change. Beginning this Monday, May 29, ALL MASSES, MONDAY THRU SATURDAY, WILL BEGIN AT 8AM. As you know, during the school year Masses on Tuesdays and Fridays were at 9am so our students could attend. For the summer, daily Masses (Mon–Sat) always begin at 8am. Our Festival is only 4 weeks off – I can’t wait!!! We’re still in need of volunteers – especially Booth Captains – so PLEASE volunteer. Working the festival is actually a lot of fun – and look at the bright side, at least I’m not asking you to volunteer to get in the dunking booth – which I’m doing again!! To sign up go to our website at www.mqhparish.com and click on the sign-up link or call Susan Foster at 859-620-0159 (email susanlf1008@gmail.com) or Mona McCammon at 859-462-1972 (email mmccammon@fuse.net). 2017 is a very special year because it’s the 100 year anniversary of when Our Lady of Fatima appeared to 3 children – Jacinta and Francisco, who were brother and sister, and their cousin Lucia. Our Holy Father Pope Francis was in Fatima earlier this month to commemorate the 100 year anniversary. At one of his Masses in Fatima he officially declared Jacinta and Francisco as Saints. Lucia only passed away in 2005, so her cause for sainthood is still ongoing. On May 13, 1917 our Lady began to appear to these three children off and on for the next six months. And on October 13 of that year about 70,000 people came to Fatima and many of them witnessed the miracle of the sun, where the sun seemed to dance and spin in the sky. Within 2 years after that, Jacinta and Francisco had died from the flu and Lucia became a Carmelite nun. Mary spoke to these children about the importance of prayer in reversing the evil things that were going on in the world – her message was that the power of prayer is greater than the power of evil. She told the children about the sufferings which the Church and the world would endure through war and communism. But she assured them that her Immaculate Heart and our continuing fidelity to Christ would triumph. Mary’s message reminds us that prayer, especially the rosary, is a very powerful weapon in fighting the forces of evil. Our Lady of Fatima, pray for us!! !